After splitting their first two games against La Salle and Penn in the Big 5 Tournament, Jackie Morrison, Yun Yi Zhang and Chelsea Tupuola led the Owls back from a 5-1 deficit to beat Villanova. Ariel Pierre, the Atlantic Ten Conference Defensive Player of the Week, registered a game-high 13 digs in a three-set victory against La Salle in the Big 5 Tournament. Yun Yi Zhang recorded eight kills versus the Explorers. Chelsea Tupuola added a game-saving dig against Villanova. After a heartbreaking loss to Penn in five sets Friday night to open the Big 5 Volleyball Tournament, the Owls (2-3) stormed back Saturday afternoon with a convincing sweep of La Salle and a thrilling five-set victory over Villanova to finish in second place. In Game 1, a three-set triumph over the Explorers, it was all Owls, 25-10, 25-15 and 25-20. Senior captain Jackie Morrison continued to lead her team, racking up 26 assists, seven digs and four kills, a statistic that usually belongs to junior outside hitter Yun Yi Zhang. Zhang, who was named the Atlantic Ten Offensive Player of the Week, played only two of the three sets but still led the game with eight kills. Junior Ariel Pierre continued to show why she is the reigning A-10 Defensive Player of the Week with a game-high 13 digs. Game 2 proved to be the toughest and in the end, most rewarding win to date for the Owls. A drama-filled, five-set match tested Temple. The Owls fell, 25-9, in set 1, as the Wildcats went on an eight-point run at one point. 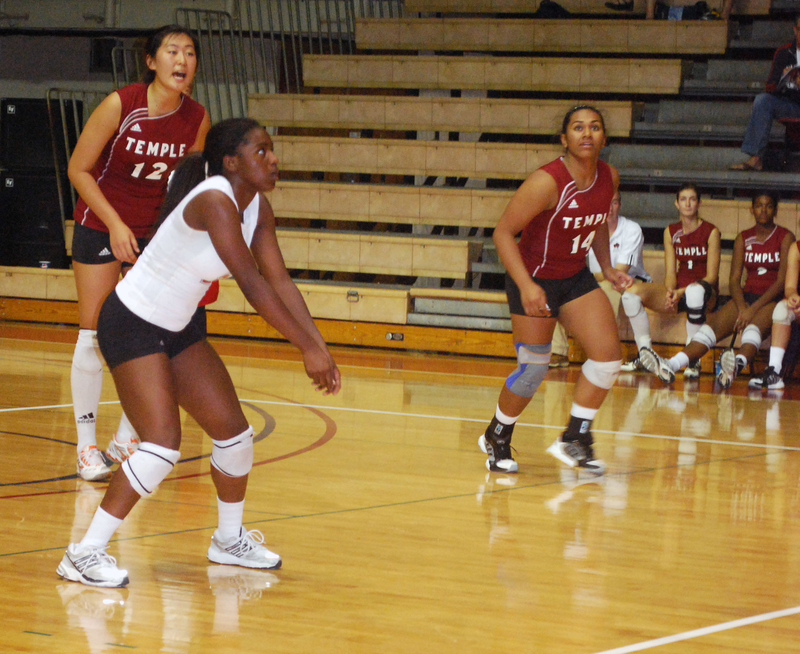 In set 2, Temple and Villanova traded points until the Owls pulled out an eventual 25-23 victory. Junior Jessica Antosz made big stops in the middle against Villanova’s two big outside threats, sophomore Morgan Petkovich and freshman Krista Andersen. After set 3’s 25-20 loss, Temple bounced back with true freshman Chelsea Tupuola. She saved shot after shot against Villanova on the way to a 25-18 win in set 4. Villanova got off to a 5-1 start in the shortened set 5. After a timeout, Zhang, Tupuola and Morrison led the Owls back to a 12-12 tie highlighted by a Morrison slam. From there, Tupuola made a game-changing dig that Zhang followed up with her 33rd kill for a 15-13 win. Morrison had a big second game with her 43 assists but still thinks the communication can be better. Coach Bob Bertucci shared the same views as his team’s leader. One person on the support group has to be Zhang, who is the main component in the offense. Along with Morrison, she was named to the All-Tournament Team, but would rather have something else than personal accolades. “That’s all just extra,” she said. “All I care about is the team winning. I’d trade individual awards in for three wins any time. This team can go so far, all we have to do is play together. Villanova coach Josh Steinback had high remarks for Temple’s offensive weapon as well. Temple faces two-time defending National Champion Penn State next on Sept. 18 at McGonigle Hall. Christian Audesirk can be reached at christian.audesirk@temple.edu. Nick Sharga dedicated his bench press portion of the Pro Day to raising money for Uplifting Athletes, a non-profit organization with advocacy, outreach, research and educational programs on rare diseases.